In the nine years we’ve lived in Hobart there have been two restaurants that have created division within the clown house; the Manor Grill and The Astor Grill. I love meat. I probably need to be careful who I say that to late on a Saturday night when I’m deep in my cups, but any restaurant with the word ‘grill’ in the title is going to get my attention quick smart! Furthermore, I’m sure this Pavlovian response is precisely what the nefarious proprietors of these restaurants are trying to achieve! I tried the Manor Grill. It was terrible. Thankfully Karen wasn’t exposed to such a traumatic experience. Of course, I was subsequently on the receiving end of a massive “I told you so!!”. The dining room is quite clearly a throwback to mid 20th century stylings, but in the best possible way. Wood panelling, art deco lighting, textured ceilings and crisp white linens, it all reeks of old world charm and sophistication, but without the haughty attitudes that so often accompany such a decor. It’s the kind of restaurant that feels like home; a place to relax, unwind and enjoy a quality red with friends; a safe harbour in Hobart’s often turbulent and ever-changing food scene. 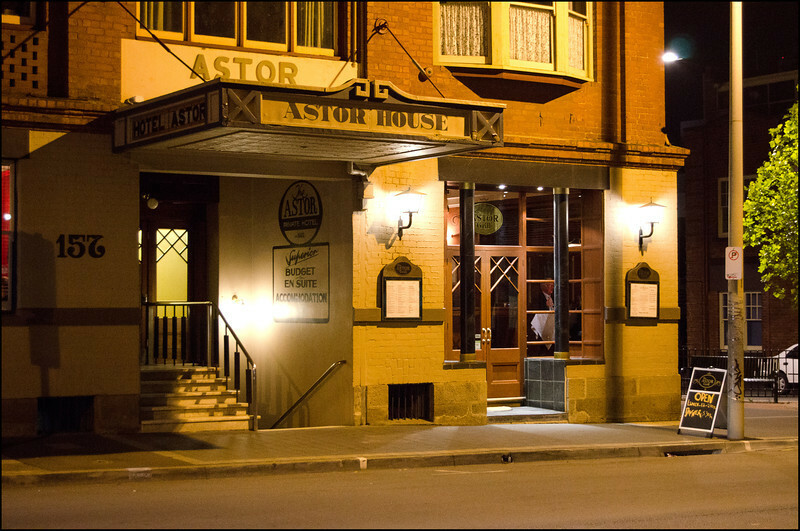 I can see myself coming back to The Astor time and time again, because not only was the ambience so relaxing, but their steaks were cooked with precision and the utmost respect. 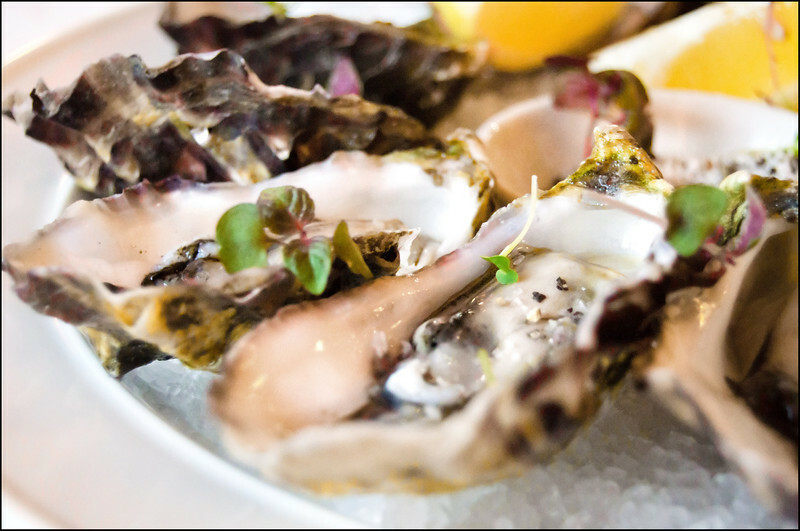 To start the evening we shared a dozen oysters, natural with cracked pepper, sea salt and lemon ($33). Plump and bursting with flavour, this was the perfect way to start the meal! We had already indulged in a hearty lunch at The Coterie earlier in the day, so we didn’t want to spoil our appetites for the steaks later in the evening. These oysters did the trick quite nicely! For the main course I vacillated between the 250g Cape Grim Eye Fillet, the 300g Black Angus Scotch Fillet and the Steak Astor, their signature dish! 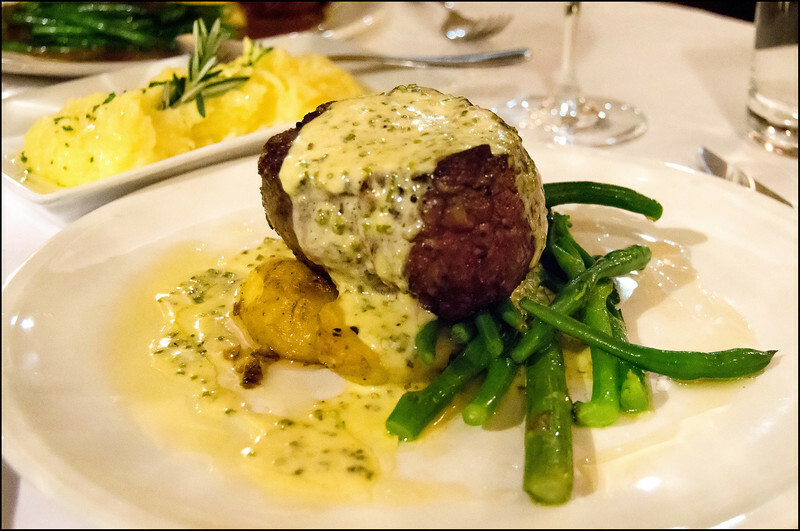 In the end I decided to take a leap of faith and try the Steak Astor ($39.50), a 250g Cape Grim Eye Fillet served with a Stilton cheese sauce. On a burger, yes please!! But on a steak…? This is one flavour combination I wish I had discovered years ago!! The musty funk of the Stilton added an edge to the steak that worked seamlessly. A constant presence, yet not overly powerful, it was simply divine! And the steak? I requested it rare, and you know what? It was perfect. I don’t understand why it is so difficult for purported experts to cook a piece of meat to the customer’s requirements, but at The Astor you get exactly what you ask for! It’s no mean feat either when you consider that the steak is around 2 inches thick in this instance! For those that are interested, I would rate this the best steak in Hobart (obviously you don’t need to have the cheese sauce), followed by ‘The Ball and Chain’ and ‘Roaring Grill’ in equal second. Karen chose the Cape Grim Eye Fillet Medallions ($34.50), consisting of three very decent sized medallions of beef, on a truffle oil potato mash and a bed of greens, served with a cream, bacon, red wine and mushroom sauce. Again, the meat had been cooked as requested and was simply delicious. The sauce was flavoursome, but did have an overly oily consistency which we suspect was a result of the accompanying mash. As you can see from the photo below, they are very liberal in the application of the truffle oil! 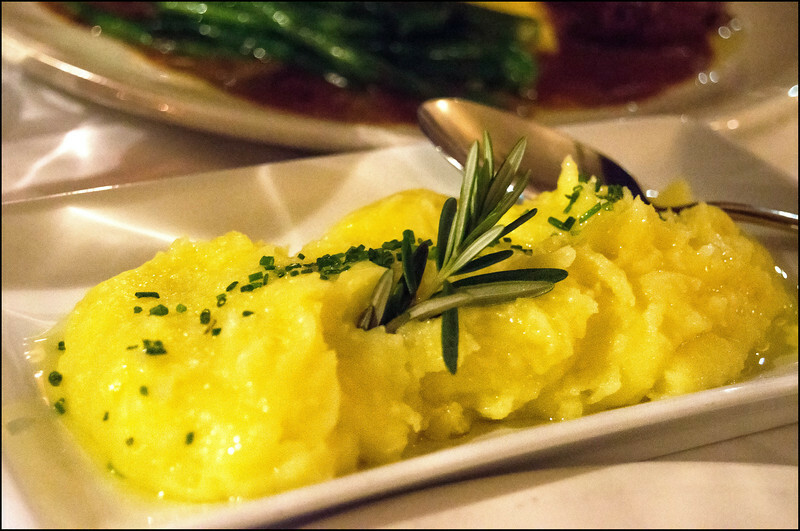 A shame really, because the underlying mash was fantastic, with the flavours of the rosemary and chives permeating through wonderfully. A special mention must be made regarding the wine selection. It is one of the best I’ve seen in Hobart! Not only do they have an extensive range of wines by the bottle, but they also have an extremely generous list of wines by the glass ($8-$11). So often when all you want is a couple of glasses, you are limited to a selection of two or three reds or whites, of which one is no doubt a ‘house wine’ of dubious quality. At The Astor you have a selection of 10 whites and 8 reds. Of these, three were listed as being ‘Astor’ wines, yet being sourced from Hardy’s would suggest they are a cut above your average ‘house wine’. Simply the best steaks in Hobart. It’s their specialty and they deliver in spades! The Astor is the perfect restaurant for a special occasion, business lunch (as I experienced the following week..and yes, the quality was just as good the second time around!) 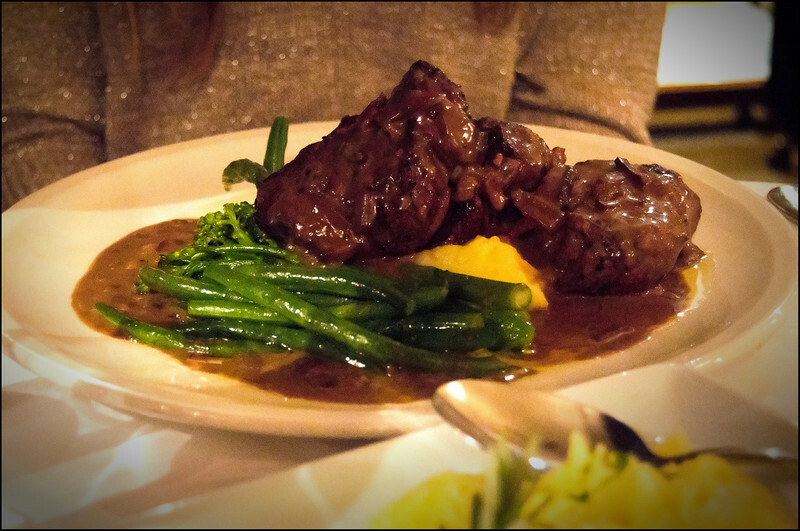 or simply for a good, hearty feed with a touch of class. Don’t let the dodgy façade put you off, The Astor is a truly unique establishment that I hope remains true to its roots, resisting the inevitable pressures to modernise. It is confident in what it does well, and if you make it your establishment of choice then rest assured that you’ll have a great night out! I notice on their website that they are also offering a special menu for Christmas functions. Could be worth looking into if you’ve left it to the last minute! I agree with Karen on “grill” conjuring up visions of bad hotel food! Glad to see that you had a different experience at this place. The food looks good! We were taught to always release/scrape the oyster gently from the shell at the culinary school. Never seen oysters attached to the shell either..
Blue cheese is another cheese that pairs well with steaks! Thanks for confirming that for me. I wasn’t sure if it was just me being pedantic or not! How’s the training going? Got long to go? School is done. Finishing up internship in 2 weeks! Its been a busy year. I am happy that I am done. Now I can spend some time chilling, writing blogs, hiking and learning photography! Happy Holidays to you guys. That’s fantastic! Hopefully it leads to new opportunities in the future 🙂 Looking forward to more blog entries from you! Have a great Christmas as well.